We've all been in that position when we want to plug our iPod / MP3 player / PCDP or other portable device into our home stereo. Today's smartphones let you stream music from your computer, radio stations and services like Pandora straight through the web; it's tough to disregard all this utility and flexibility when compared to something like the single disc CD player plugged into your rig. 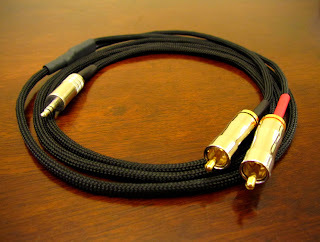 In today's blog, I will be constructing a simple but excellent sounding mini to RCA cable that can bring all those modern features to your home amplifier. 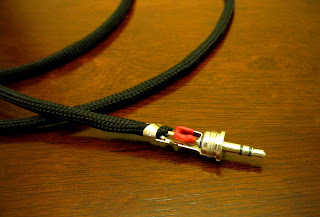 A mini connector, also known as a 1/8" or 3.5mm TRS (Tip, Ring, Sleeve) is the de facto standard for portable headphone connections and has been around since the mid 20th century, being used with earpieces on transistor radios. The original 1/4" version dates all the way back to 1878 (!) and was used for telephone switchboards. This mini connector is connected to a braid of wires that then convert to a left and right RCA connection. 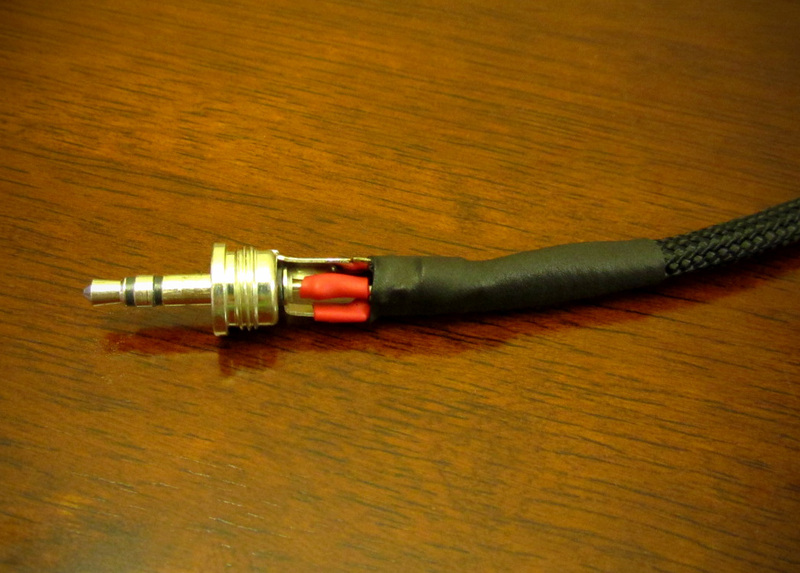 RCA connectors were designed in the 1940s to connect phonographs to amplifiers. It's a mild curiosity why the industry is still using such an age-old connector designs. 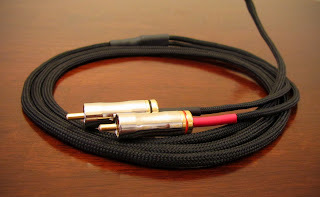 More modern and esoteric designs like the iBasso Toucan and Ray Samuels SR-71B make use of unique balanced connectors such as the 6 pin Hirose and 4 pin Protector, designs that will likely never make it to mainstream audio equipment, but it's nice to see the designers offering these options. I'll be starting this mini to RCA cable by trimming four strands of equally long wire in preparation for braiding. I'm choosing silver plated copper in Teflon as it has nice sonic properties and is relatively inexpensive compared to boutique audio wire. Silver plated copper (SPC, as I call it) in Teflon is offered by companies such as Belden and can sometimes be found as military surplus (mil-spec). Not all SPC is created equal, and you'll want to be sure you're getting silver plated copper and not tin plated copper. 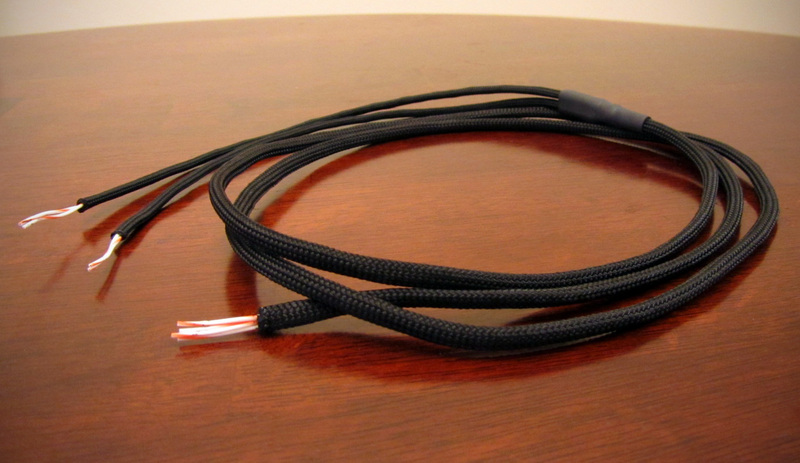 SPC is discussed in more detail in my post describing custom made SPC Speaker Cables. 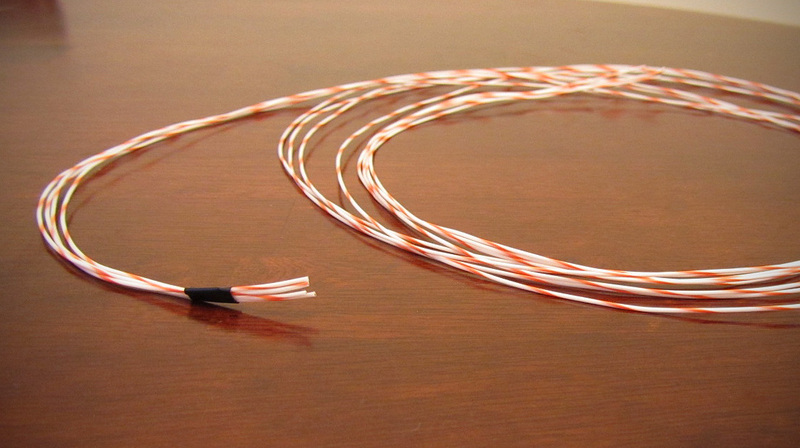 Once the wire is laid out, the strands are braided into a formation of four wires so that the cable maintains the same EMI/RFI rejecting geometry all the way across the length of the cable. Do note that one needs to cut the wire a little longer than necessary as a few inches of length will be lost in the braiding process. Once the braiding is complete, the wire is fed into a sleeve of soft black nylon multifilament. This gives the finished product an attractive look. 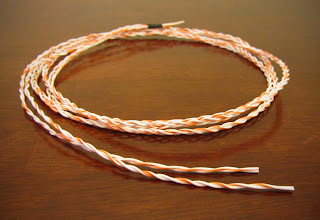 Nylon sleeving can also help negate microphonics in headphone cables. At the Y-split, I melt the multifilament together to ensure that it does not separate when pulled or tugged. A Y-split is also added with multiple layers of adhesive heatshrink. You can see an another take on a Y-split in my custom AKG K1000 cable post. RCA connectors will now be added to the two twisted pairs of wires. 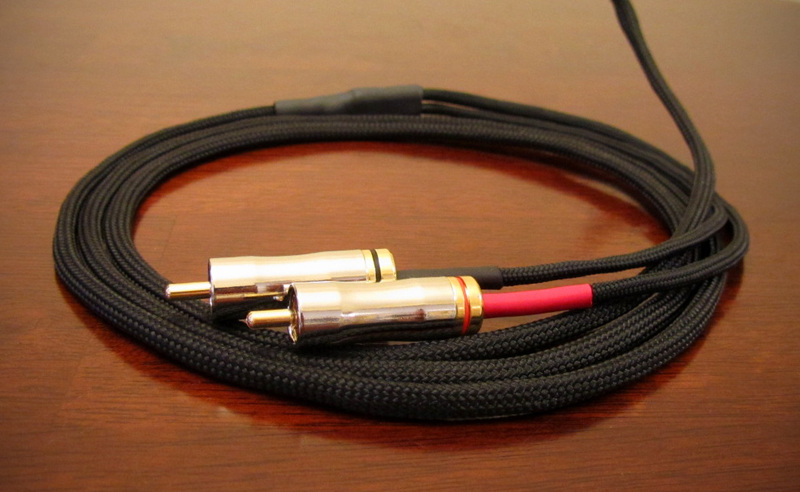 Some sleek-looking chrome plated RCAs were selected for this particular cable, but I will typically use Canare F-09 or Switchcraft 3502 series gold plated RCAs as I have found them both to be well-built and reasonably priced. Next comes the mini to mini connector. I almost exclusively use Switchcraft 35HD series connectors. They are made in the USA, sturdy, and not too large. The Canare F-12 minis are nicely made, but the barrel is very large compared to other connectors. If one needs a plug that's physically smaller than the Switchcraft, the Neutrik NYS231 will fit the bill. It's about a quarter of the price of the Switchcraft but doesn't seem quite as solid in my humble opinion. The Switchcraft connector has a small piece of metal on the ground connection that I personally don't use, so it's trimmed off with metal snips. 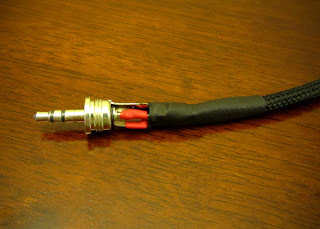 Once the soldering connections are made, all connectors are tested for continuity and shorts using a multimeter. They are then isolated with heatshrink as an added precaution to prevent shorting. 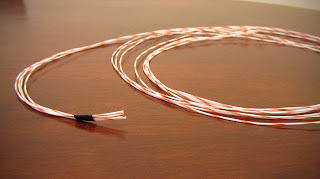 The crimp on the ground connection holds both the wire and sleeving in place and prevents strain on the soldered connections. As an added strain relief, a piece of 1/4" polyolefin black heatshrink secures the sleeve to the ground crimp. The barrel is now screwed onto the Switchcraft mini connector and that completes the mini to RCA cable. Apologies, I forgot to ask my question. What guage wire did you use when building these? I'm suspecting you used 22 AWG. Hi there my friend, thanks for the nice comments. 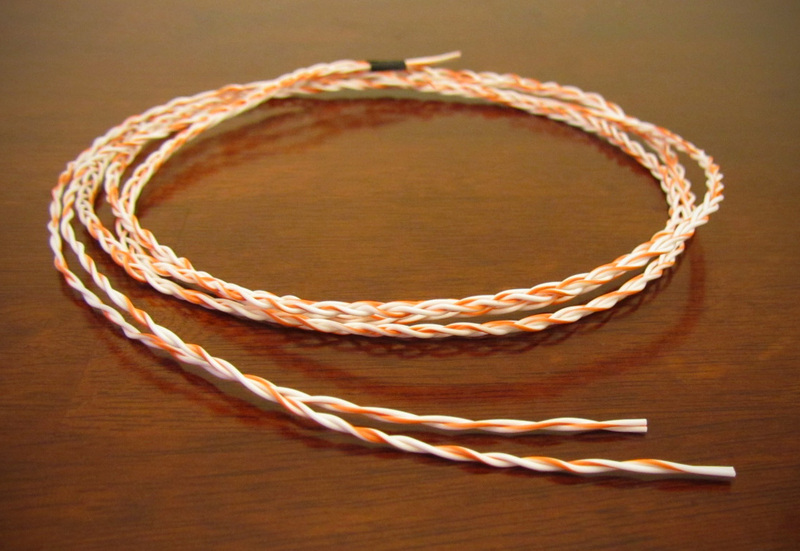 The wire is a 24 gauge silver plated copper in PTFE. 22 gauge would also be perfectly acceptable. "Hey there! I've spent the past 3 HOURS reading your various builds and have to say that I'm very happy (& impressed) you spent the time to do so. I spent 7 and 1/2 years in the Air Force as an Avionics technician and then spent 2 years with Paradyme in Sacramento, CA in their Home Audio/Visual division designing, engineering, and ultimately selling high end systems in both the theater and 2channel realms. I've recently migrated over to the headphone side of things because I always stood clear of it for reasons that no longer apply. I've always been a fan of the MIT Shotgun wiring and interconnects but have grown tired of the cost to obtain them. What this is all leading to is that, with your guidance here, I too am now going to go this route of building my own wiring but I just never knew where to gain the appropriate materials (THANK YOU!). So, coupled with your extensive knowledge in advanced electronics theory as well as in solid-state and tubes, I'm on my way to my next ventures. I've always been a wiring nut and have argued the benefits of great wiring compared to the technologically prehistoric, marketing 1st, crap from the [company edited out] of the world. I even proved it to some Intel snobs once LOL. Anyway, it's nice to see guys such as yourself in this world that will build and sale the good stuff to the masses. Apologies for the tangent but I'm pumped now. Thanks a bunch and best wishes to you and your business ventures. I look forward to future purchases from your respective website and company in the near future." Thanks again! 24 guage will save some coin. Any recommendations on very sleek, slim RCA connectors? My vintage Pioneer stereo has such close spacing between RCA connectors that no store-bought cables fit -- except for the super cheap, fall-apart-quality cables at the dollar store. Hi Charles, that's a very good question that I unfortunately don't have the answer to, but I'm hoping one of the readers here might. The Canare F-09s have a "slim" body but older components like vintage Dynacos have RCAs so close together that I doubt they'd even work. Hi, what size of black nylon multifilament did you use? I believe this was 3/16", a great general size to use.